A core walking group of 6 devoted walkers walked in the rain today for Walk With a Doc led by Kayt Wolfe of Pulse Health Coaching. We used the Be Active orange umbrella fleet to keep our walk going. Nutrition was the topic of the day and Kayt debunked numerous myths concerning fat, grains, eggs, dairy, salt and more. No matter what, we just keep moving! Join us any Wednesday morning if you are free in the daytime or have an hour or so. Its also a great social outlet and removes the isolation factor that some elders struggle with living alone. 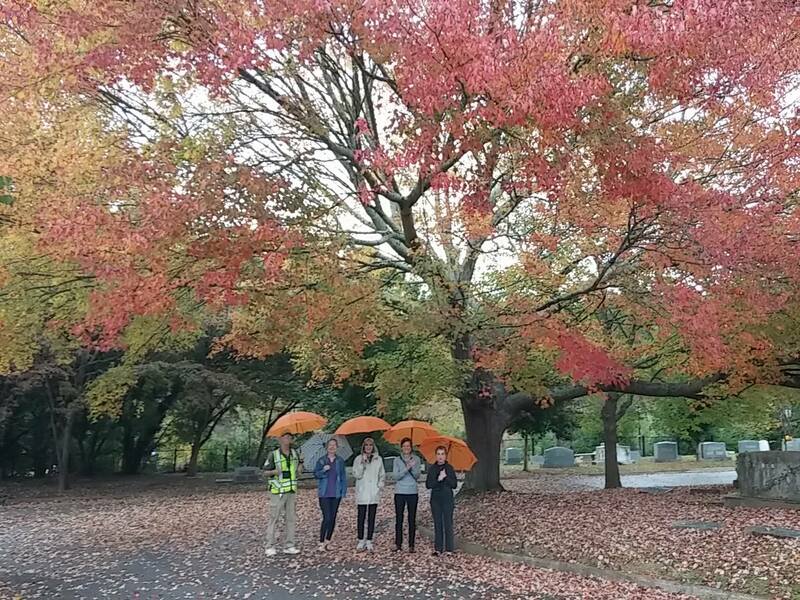 Here’s us on our colorful stroll today through the Decatur cemetery greenspace. Hope to see you soon. Our next walk is November 12, and will feature a guided tour of the Decatur Cemetery focusing on the historical “docs” that reside at the greenspace, So come learn your local doc history with Friends of the Decatur Cemetery docent Cathy Vogel.